I took a week totally off after the Carlsbad Marathon on Jaunary 19th. This has pretty much been my standard recovery time frame for any race…marathon to ultra marathon. Next up will be the Tarawera 100km followed by the Northburn Race ultra trail race (I’m only doing 50km) in New Zealand! A lot of people and sites will mention that the “season” has just started (as coinciding with the calendar year), but I’ve always thought of any given month during the whole year as being a time to race. [this is most likely because I came from the collegiate running scene where you raced cross country hard all fall, then burned it hot for indoor track all winter and then followed that directly with the outdoor track season in the spring…then in the summer you busted your tail running triple digit mileage weeks!] Sure, you have to periodize your training and take mini breaks between training cycles and target events (often forced breaks as in the case of me getting the flu in December), but being in decent aerobic shape at any given time of the year helps build up one’s strength and speed very effectively for the future. The key is being consistent and staying healthy! Training both the aerobic system but also the skeletal muscular system at the cellular level for positive adaptation is always the goal. I haven’t been doing that much vert…. As I look forward to returning to New Zealand again in a couple weeks to defend my title at the Tarawera 100km, I think back to my training and racing last year and analyze what I can do to improve. One thing I’ve noticed has been working to utilize higher percentages of fat as a fuel source so that I don’t have to rely on taking in so many carbohydrates (ie soda pop) at aid stations. So, in my training for the past several weeks (2 weeks worth listed below) I’ve gone into some Long Runs after fasting a good 12-14 hours overnight with only had 2 spoonfuls of almond butter with my plain coffee for breakfast. The idea behind this is to go into a long run in a slightly depleted state so that the body shifts to fat-burning relatively early in the run. I also employed this tactic (much to Keith and Kevin’s dismay) while training at Hansons before I ran my personal best in the marathon. Of course after about 20 miles into these long runs I’ve been injecting enough significant pace/effort to justify taking a Vfuel gel or two (I took one on my 25 miler and three total on my 30-miler which had a lot more climbing with Mt. Sanitas) I am confident that at lower intensities (ie 60-65% of max HR) I can endure a long run without any intake of calories at all (such instances last year and earlier this year found me reduced to walking, sitting, and nearly crying after about 28 to 30 miles) Fuel is the name of the game! [or shall I say managing your fuel sources]. In terms of diet, I will not give up my Avery beer (or pizza and pasta for that matter) and go “low-carb”…they area all too delicious! Studies have shown that even a short 2-3 week phase of ingesting less carbs (ie 30% of total daily caloric intake) can improve fat utilization during moderate intensity endurance running. Still, I believe that my intake of higher amounts of Omega-3 fatty acids (usually from Flora’s 7 Sources/Udo’s Oil, and copious amounts of almond butter and avocados) as well as a diet generally low in refined sugar help me become a more efficient ultra runner. The magic isn’t in any radical diet but rather a combination of periodizing a generally healthy diet with healthy doses of aerobic training. In my opinion, adaptaions from your running alone are going to have the biggest influence on your performance and efficiency (with sleep, stress, and diet being a close second!). Three days before I start a 2.5 day carbo load before the Tarawera 100km I will discipline myself to having less carbs, and then of course during the actual race I will probably ingest around 25 to 30 Vfuels! [note: Vfuel gels also have fractionated coconut oil as a fat source]. 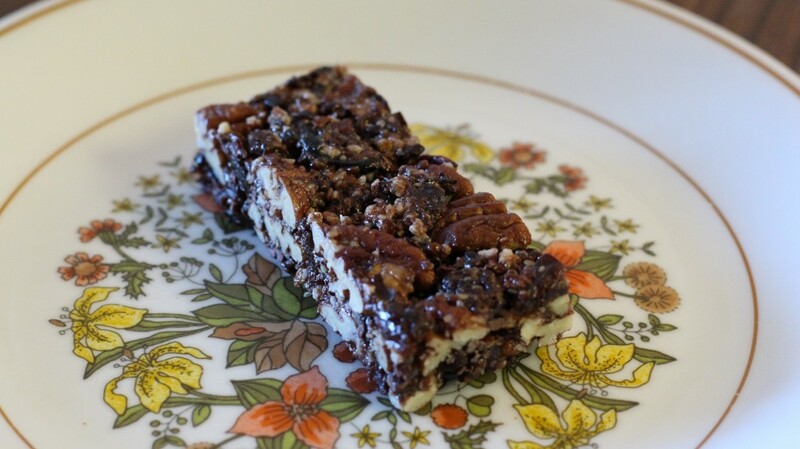 This delicious morsal is a UGO Bar. It mixes quite well with an afternoon coffee. Check them out HERE! 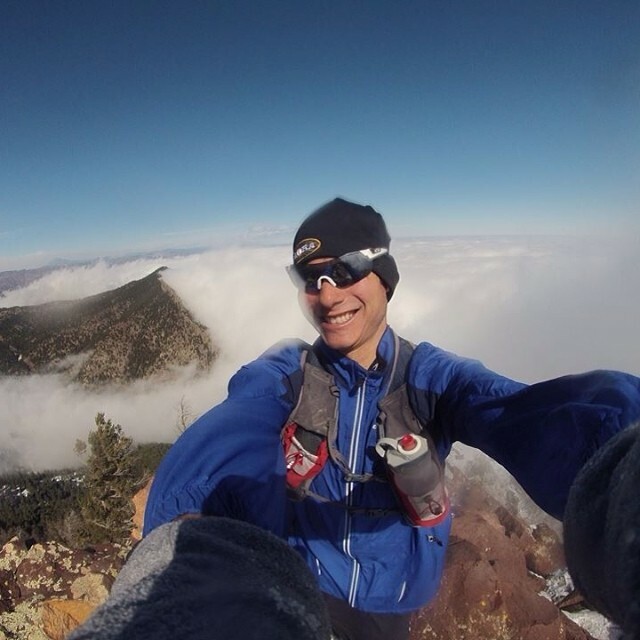 2-11-14: Easy 2-mile warm-up to Marshall rd. Then Lactate Threshold session of 4 by 2 mile repeats back and forth (slight U-shaped hill with changing wind direction). Splits 11:05, 10:41, 10:54, 10:35 with a half mile jog (4:30) between. Little slower than marathon pace, but effort felt about right with HR in the 160s-170! Not too shabby coming off the marathon break given the wind and altitude. Legs solid. 2-12-14: Easy 12 miles icey/snow trails on Eldo Canyon with Sandi (shooting some film with the SLR). 1700’ in 2.5 hrs. 2-17-14: Easy 10.25 miles trails. 1200’. Legs a bit tired (hammies). 2-18-14: Bear Peak up west ridge. Did a lot of back and forth and stopping to film. 13 miles, 4000’ , 3hrs. 2-22-14: warmed-up 2.5 miles, Then: Lactate Threshold workout of 2 by 4 miles W. Res trail loops: 22-22:30 efforts each with HR in the 160s. Took a mile jog recovery (8:30) between. Got the muscle tension in the legs up climbing on the loose rocky trails and split some sub 5:20 miles coming back on the trail with a tailwind. Solid. Extended cool-down. 15 miles for the day, 700’. 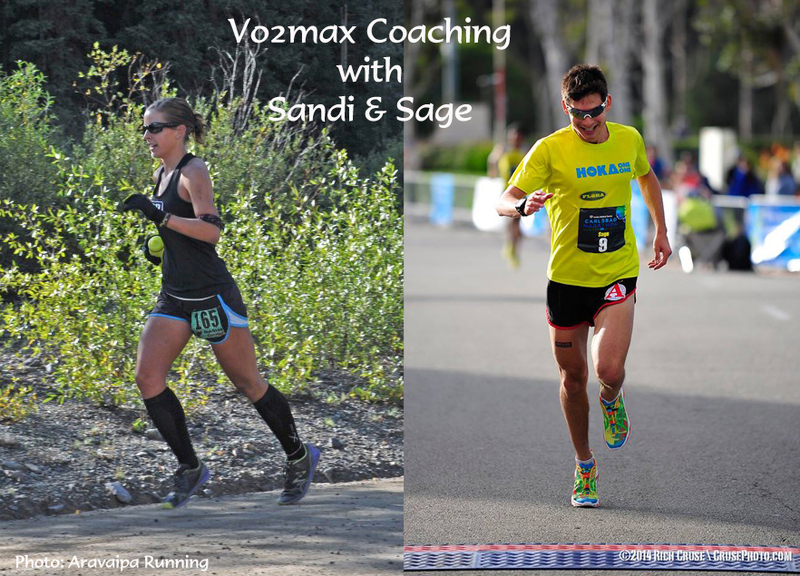 Sandi and I still have a few more slots left for our Vo2max Productions, LLC Monthly Coaching online service. We offer custom, monthly training schedules and feedback for runners of any speed and target race distances (5km to 100 miles) from the mountains and trails to the road and track! Cost is $100/mo. Thanks to the generous support of donors on the Kickstarter page, The MUT Runner film project is underway with massive amounts of editing and interviews already complete. We’re still planning a tentative release in May 2014 on DVD and digital download. For additional support (much appreciated) you can still donate (for awards as per listed on the Kickstarter page) HERE. Thank you! Cassie Scallon! The latest athlete interviewed for MUT Runner! I wish you all the best in your running and hope to see you at some events! Thank you again for all the support! Sage, glad to hear your training is going well and I’m stoked to see you doing some road events also. You may find this study by Canadian exercise physiologist Trent Stellingwerff interesting since it discusses limiting dietary carbohydrates during training. Perhaps you’ve seen it, perhaps not…hope it helps. Thanks for the excellent article/study! I hadn’t seen it before, but now that I think about it – it is exactly what I want to do (strategically limit carb intake for certain runs/workouts but not all the time in my diet (and of course not during races!). Thank you for the insight. I’ve even raced with (read: behind) one of those guys! You’re welcome Sage, glad you found it interesting. Watson and Wykes are local (Vancouver) fast guys. I have been experimenting a little with runs before breakfast myself (only 6-8 miles usually), but mostly to try to stay lean. Just out of curiosity, what did the Hansons say against this practice? I thought it was common for the Hansons Brooks athletes as well as many D1 college athletes to do morning runs before breakfast? I have heard solid arguments against altitude training for sea level competition (decreased blood plasma and lower intensity intervals) but it seems to me like a 90 minute to 2 hour effort with little to no fuel is fine unless its a race. I definitely believe in getting in simple sugar within the first half hour after finishing though. What was the fueling practice DURING a half marathon race? just water or something else? or nothing? Yeah I don’t take anything for half. Really should be no need to take in calories until the race is at least 16 miles…esp at sea level. Hi Sage, I’ve been doing a ketogenic diet and targeting carbs for my harder workouts (not strict on weekends — must have pizza and a beer or two!) and have been doing “starvation” long runs to increase my fat burning. I usually run on just coffee for 3-4 hours in my MAF zone. Do you add the almond butter to kickstart the fat burning since the body utilizes the fuel that’s most available or to keep the hunger pangs at bay? Good luck at TW… I’m looking forward to seeing you and the bearded one battling it out! Thanks for your comment! I would be hesitant to call them “starvation” runs as I’m usually not really hurting that bad in the hunger department (don’t limit your calories too much and always make sure you get enough in after a long run for sure). I take the almond butter mainly to fend off any huger pains – but the higher healthy fat conent and protein for sure help add some optimal fuel that might be utilized quickly during the run. I should also note that the almond butter we get we grind at the store so it is 100% almonds (no added sugar or even palm oil) and i love drinking coffee as well (that and green tea is supposed to help with the fat burning). Everyone is different though so you’ve got to find a good balance and not be too strict with your intake. Anyway it’s great to enjoy the beer and pizza (I do a lot). The think the key is still adding a variety to the mix with your training and diet (ie only having certain, key long runs where you might limit sugar intake before and during). I’m not strict on a low-carb diet so it’s likely my dinner the night before still helps me out on the long runs – if you’re on a ketogenic diet most of the time it might be a different balance of when you get your carbs relative to when (and how far and how hard) you run. Thank you for the well wishes and best of luck with your training and future races! For your session on 2/11 (4 x 2 mile repeats w/ 800m recovery), you mentioned ” Little slower than marathon pace, but effort felt about right with HR in the 160s-170.” I was comparing you to me since, we are the same age, but this shouldn’t be lactate threshold intensity should it? If this was slower than marathon pace and heart rate under 170, then this should have been slightly slower than steady state? Which should be well under your threshold and give you little benefit to that purpose right? Just asking because I use my heart rate to monitor my steady state miles (~marathon pace) which is usually in the 175-180 range. Thanks for your comment. I’ve never been one to read too much into HR data as there is a big variation with Max HR (even for people of the same age). Also, pace/intensity/HR and “percieved effort” usually don’t align like they should in theory! So “lactate threshold/tempo run/steady state” has a spectrum of pace/efforts, but generally for most people that is about 10km race pace+ 10-15 sec per mile to half marathon race pace. For slower runners it is actually closer to 10km race pace! I know from experience that it seems like my Lactate Threshold pace is a lot closer to my actual marathon pace. As an example, a 4hr marathoner running at marathon pace for 4 miles should be a walk in the park for them (for me it feels like a fairly hard tempo run…something i cannot jump into without a warm-up and strides). So in that workout I was for sure on the easier side of LT effort (prob closer to steady state) and my recovery was quick…but the effort wasn’t easy! I’m at altitude so factor in a change in velocity of 10sec/mile. There were some slight hills on the road and the wind was being fickle (factor in more changes with pace/effort). That being said, my HR can be in the 160s and I can have a lot of neuromuscular fatigue (which is painful) just from hitting a velocity around and even slower than my marathon pace. I’m usually one to be on the conservative side as I think most runners run their tempo runs/LT workouts way too hard. Just a quick note on heart rate: for 2 equally fast/fit runners, even of the same age, the heart rate at lactate threshold can vary hugely, from low 160s to high 180s, give or take. Some of the fastest marathoners did their PRs at relatively low rates. It just reflects individual physiology and muscle type. it’s all about Running Economy. Also, marathon pace should be easier than Lactate Threshold, so HR should stay under 88-90% nearly the whole race. Great post! It’ll be interesting to see how your body adapts to more of a fat burning state in races. 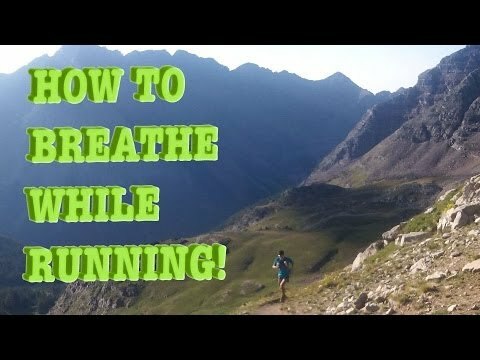 I’m only assuming this can help you in longer races where you aren’t moving as fast or intense as you would in a 50K or even a 50 miler. I know that some other elite ultrarunners rely on fat burning, and train that way and they only get faster over longer distances (Timmy Olson comes to mind). Would you alter your carb/gel intake during races if you know you can burn fat more efficiently? I know that some elites only take in 1-2 gels an hour. It seems that if you are burning fat you wouldn’t need to rely on such a high intake of gels during a race. Good luck at Tarawera! I’m excited to follow the race. Yeah I’m not going to risk it in races by not taking very many gels. If the stomach can handle it give it the high octance fuel, right?! That being said notice Timmy Olson does drink a lot of soda (Sierra mist or Mtn Dew) during races. The idea is that i just don’t want to have to drink coke and eat a gel until my stomach gets sick. This happens in the longer races I’ve done (100km) but that was before I was with Vfuel. At lower intensities I’ve done 8 hours in the mountains on 1 gel and 30-miles on zero calories so it can be done! I believe at this day an age to win a fast ultra (ie runnable) you need carbs to move! Ps- are you racing that again this year? Great to hear! Congrats on the marathon that’s a nice time for that course. I don’t do the double weekend long run. Don’t think you need it for a 50-miler (maybe a 100-miler). I’d train like a marathon, but do more trails and hills and extend your long run. Not as much need for speed on the track either. I won’t be at the CT50 this year (you’ll want to get ready for some stairs!). Good luck!